We live in a world in which new technologies that have the potential to dramatically change our lives seem to appear on an almost weekly basis. Some of these technologies go on to become massive market successes whilst others fail to meet the requirements for business realisation. 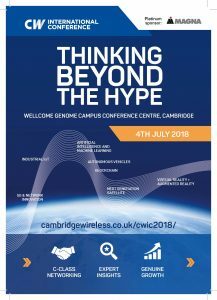 The CW International IC 2018 will be hosted in Cambridge on 4th July (Wellcome Genome Campus Conference Centre) and it will challenge, inform and inspire delegates to think beyond the hype, focussing on seven technology areas. CWIC 2018 is going to focus on a number of technologies which have received significant attention over the past year and which are being highlighted as critical for the ongoing digital transformation of society. In each of these areas it will be discussed not only the state of the art and the critical business success factors, but also the ethics of how these developments are brought to market and the potential impact they are going to have on our lives. Don’t miss the opportunity of being informed and challenged to think beyond the hype and discover new business opportunities in 7 tech areas incl. 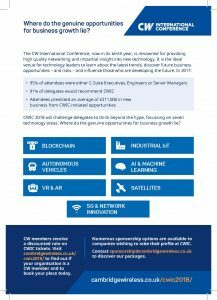 Blockchain, 5G, AI at CWIC 2018.